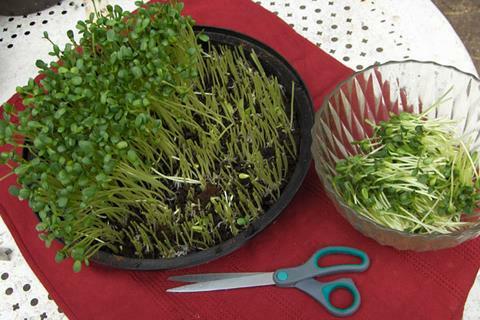 Growing your own micro-greens is not only the easiest, cheapest and most rapid way to grow your own salads, but is also a guarantee of the highest nutrient level, freshness and organic purity of your food. Sprouts and micro-greens have a far higher nutrient content than normal vegetables, for example lettuce, even if that lettuce is organic and freshly picked, something you are anyway unlikely to obtain from your local shop. I recently saw in a central Nimes [France] store a tiny handful of these same sunflower greens, packaged in polystyrene and plastic, being sold for over seven euros. With rising food prices and the poor quality of the chemical-ridden produce sold in most stores, learning to grow your own organic greens indoors is potentially a life-saving art. It is also a means to become self sufficient if you are able to produce your own organic seeds. Two of the most delicious micro-green salads are black sunflower seeds and snow peas. 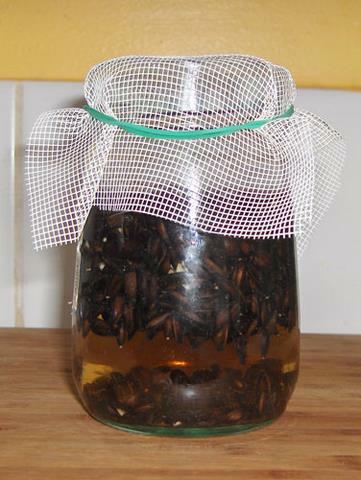 This demonstration is with black sunflower seeds. You can grow the flowers in your garden throughout the summer and harvest the seeds to provide you with fresh salads throughout the year. Sunflowers are easy to grow in a variety of climates. I grew this batch of micro-greens end February/early March. Because they are grown indoors next to a window in any warm room, it is possible to grow these salads throughout most of the year. Only in the very dark and cold months of winter might this method need a supplement of electric lighting to boost its growth. 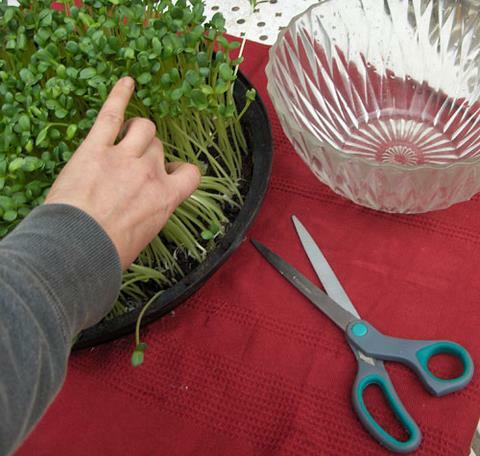 The average tray of micro-greens takes about a week to reach full maturity, at which point you simply harvest them with a pair of scissors and put the used soil mat into your compost bin where it will be recycled into fresh nutrient-rich compost within two to three months. 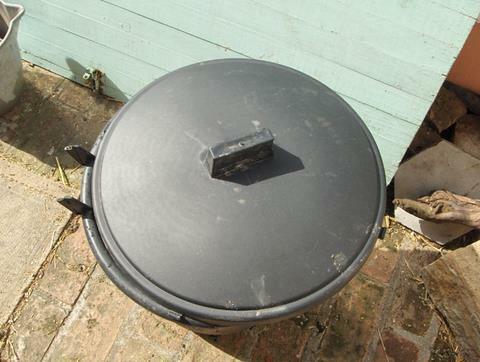 A rotation system of two compost bins can be set up outside or even under a table in your kitchen. This method will be explained at the end of these instructions. 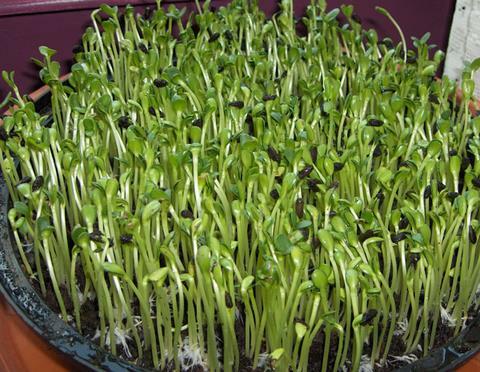 Black organic unhulled sunflower seeds are the best for growing micro greens because the seed pods come off the leaves more easily, producing a neater crop. 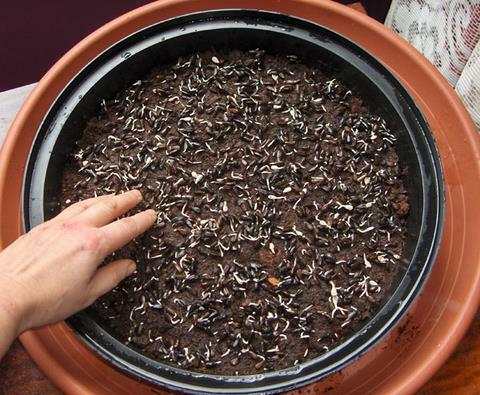 Attempting to grow greens from hulled sunflower seeds will produce messy crop full of rotten seeds, as not all of them are whole or alive after hulling. 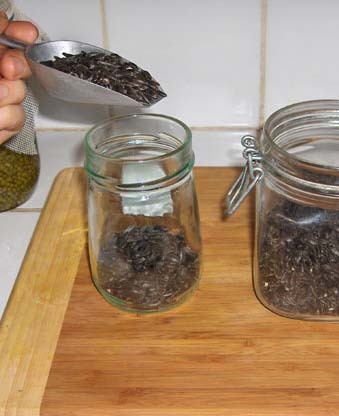 1) Put three table spoons of seeds in a jar. 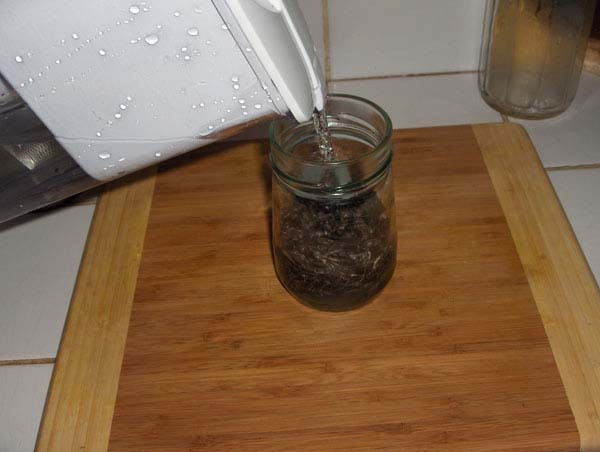 2) Fill the jar with water, preferably spring water or filtered. 3) As the seeds are full of air, they will float. Some people like to jam them down with some type of weight. However, I find that simply pushing them with the fingers so that they all become fully wet is sufficient, even if they continue to float. 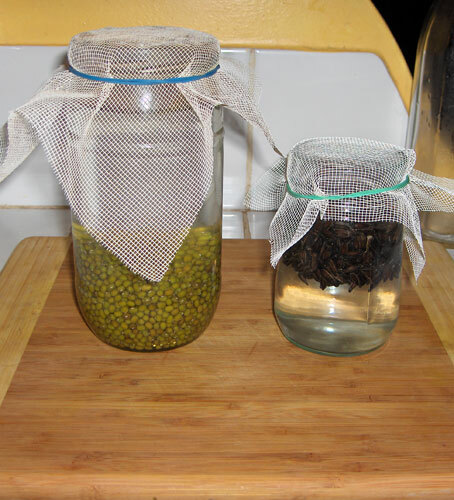 4) As with your normal sprouts, cover the jar with mosquito net or muslin attached with an elastic band. 6) The next day your seeds will have rehydrated and swollen in size. 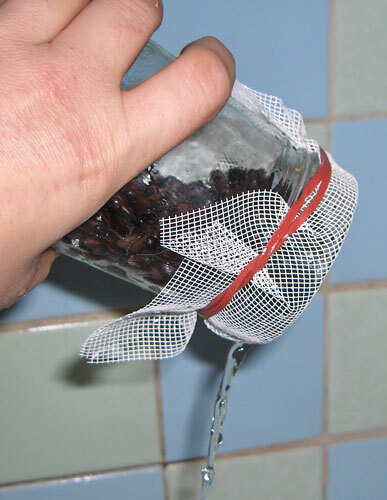 7) Pour out the water and hold the elastic band in place if you’re not sure it’s tight enough, otherwise you may risk dropping all the seeds in the sink. 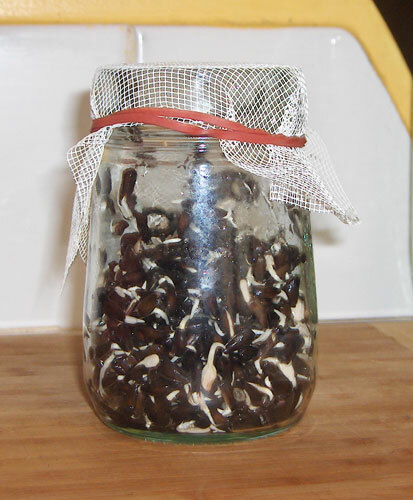 As with all sprouts, refill the jar with water and empty it again, in order to rinse the seeds. Always be very careful that you are indeed using the cold tap and not the hot, an easy mistake to make which will kill your seeds. 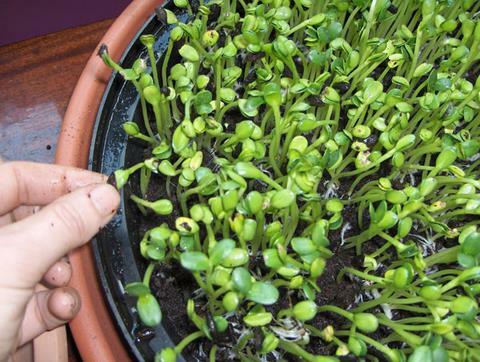 8) Put the seeds to sprout in just the same way as you do for your normal sprouts, on a dish rack, at an angle where the water can drain out easily onto a dish and the airflow is not blocked so that the sprouts can breathe easily. 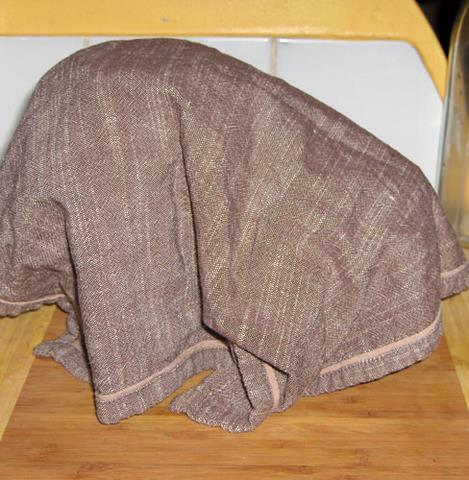 9) Cover well to prevent any light from reaching the jars. Light will inhibit the growth of sprouts. Leave overnight, and the next day rinse the seeds and put them back to drain on the rack under the towel in order to grow for another day and night. 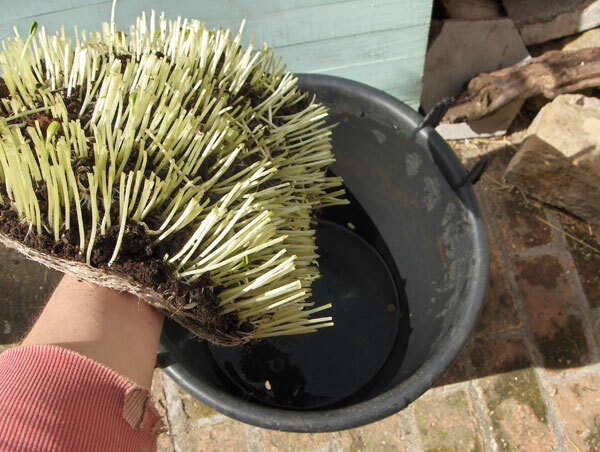 As with all sprouts, give them a rinse twice a day, morning and evening. 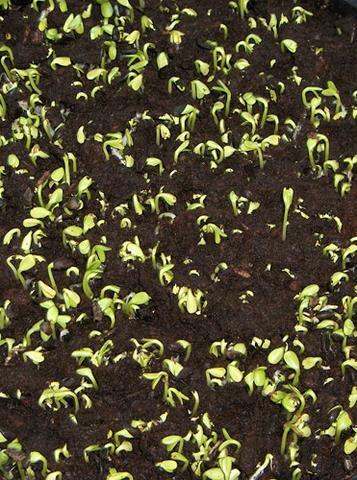 10) After a day or two the seeds will have begun to sprout white shoots outside of their hulls. They are now ready to plant in a shallow soil tray. 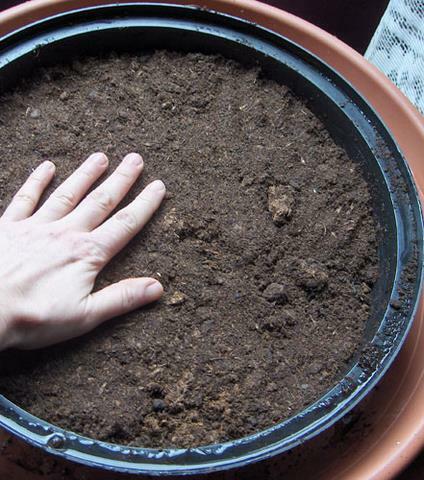 11) Either buy a seedling tray from your local gardening store or make your own by drilling drainage holes in a shallow plastic undertray for a potted plant. This one has a diameter of 31cm. 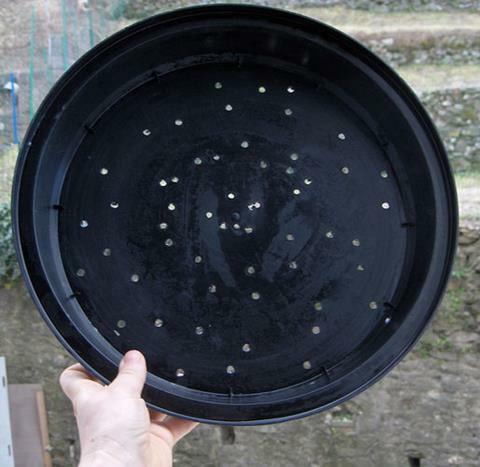 12) You will be placing your tray of planted seeds in another slightly larger tray for catching the water. Your seedling tray will need to be elevated so as to permit the water to fully drain out of the soil rather than having it sit in a puddle. 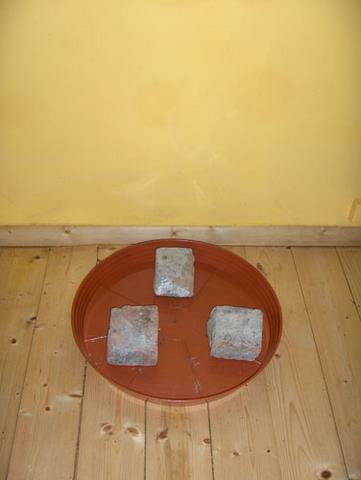 Here I have used a floor tile broken into bits to provide four stable stones of equal height for elevating the seed tray. Note for cat owners: if your cats roam freely in the same room as your seedling trays, you will notice that they rapidly transform into cat litters, as fresh soil is irresistable to our feline friends. Either make sure that your beloved fluffies are shut out of the room for the period that you are growing the greens, or attach a system of protective mesh around the whole set up. This can be done with sticks of bamboo tied to the table legs, around which you can attach the wire mesh. 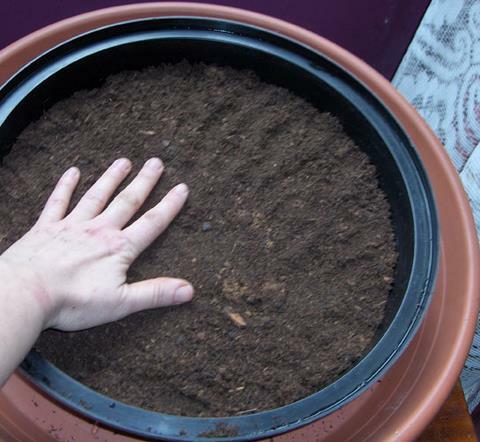 13) Put the seedling tray on top of the stones in the under-tray and add two centimeters of (preferably organic) potting compost into the seedling tray and tamp down gently with your hand to provide a flat surface. 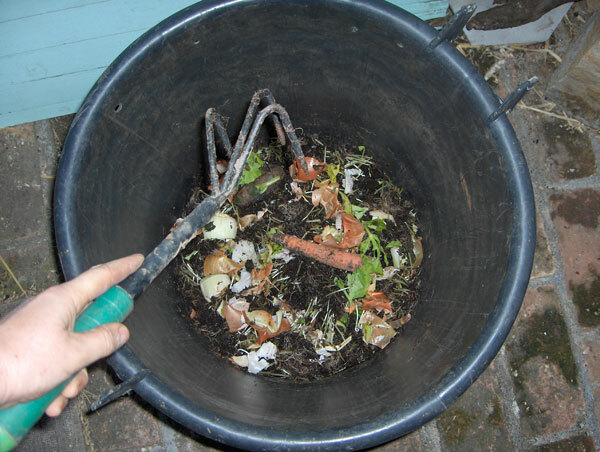 You can buy potting compost from any garden store and as you will be putting the remains, after harvesting the greens, into your own compost bin, you will soon be using your own home made compost free of charge. 14) Water the soil so that it is fully moistened. The smaller the watering can the better because a larger spout is likely to disrupt the surface of the soil with an overly heavy flow. I find that a children’s watering can is perfect. 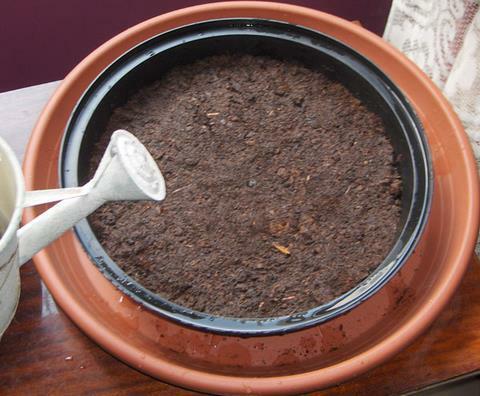 15) Now the soil tray is ready to receive the seeds. 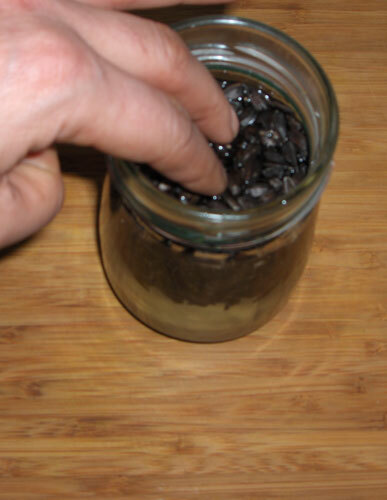 Take your jar and scatter the seeds onto the surface of the moist soil. A few seeds will remain stuck in the jar, just turn it upside down and give the bottom of the jar a few knocks to make them fall out, if any still remain, gently remove them with your fingers. 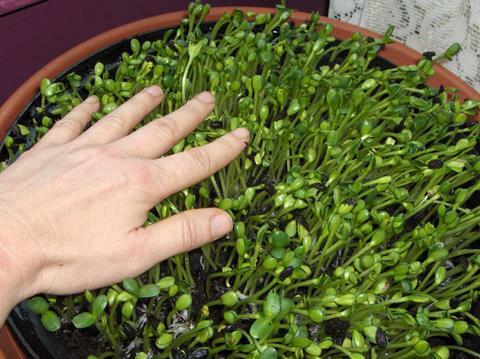 16) Now, very gently so as not to damage the fragile shoots, spread the seeds out evenly on the tray of soil. 17) Sprinkle a light layer of soil on top of the seeds, just enough to cover them, and very gently tamp down. This will prevent sunlight from harming the baby shoots that will now begin to grow upwards towards the sunlight of their own accord. 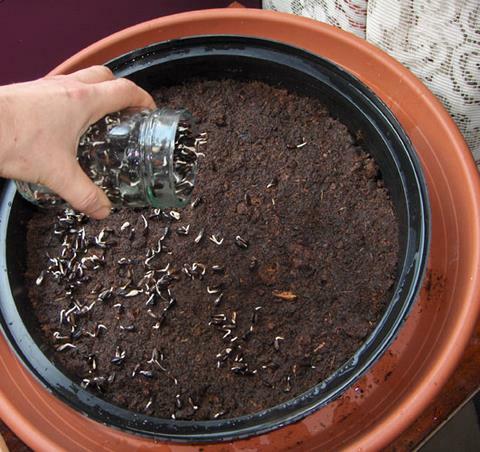 18) The top soil you have just put onto the seeds is dry and will need moistening. However, pouring water on with a watering can will disrupt the surface of this fine layer of soil, exposing the seeds you have just covered. Therefore, only ever moisten the top soil with a garden spray of water, as shown below. 19) After two or three days you will see that the little sunflower leaves are beginning to push through. You will need to use your own wisdom with how much to water the soil in the first three days. Often it is not necessary to water them at all, but in the hot months of summer, it is important to check that the soil doesn’t dry out. 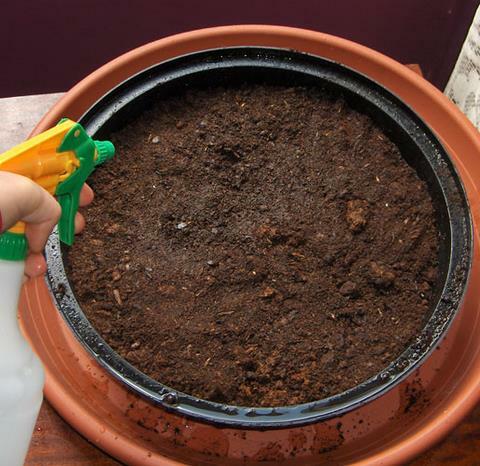 If it dries out in the first couple of days, moisten only with the spray so as not to disrupt the soil. However, once the leaves are pushing through, as in the picture below, you will notice that they rise up and at the same time raise chunks of soil into the air. At this point the watering can is very useful so that water can seep through the soil to make it fall back down to root level. Naturally, having soil suspended in the air in chunks above the leaves can prevent the sunflowers from growing efficiently. If, after watering, there are still large lumps of soil suspended above the leaves, you can help it fall back down again by very gently poking it with the tips of the fingers, being careful not to flatten the whole mass down and trap the uprising shoots. 20) Here you can see how the soil naturally falls back down to root level after each watering session, exposing more of your leaves to the air and sunlight. It is the sunlight which produces the beautiful green in your shoots. This chlorophyl has highly healing properties as it cleans the blood and body in general of toxins, including the widely prevelant candida. 21) After a couple more days your shoots will be rising up and out of the soil and beginning to lose their black hulls. 22) Here you can see a tray of sunflower greens that have very nearly reached maturity. If any shoots have been completely uprooted with their roots being pushed upside down and upwards into the air along with the leaves, then just gently poke the roots back down into the soil with the tip of your finger. 23) After watering, when the leaves and remaining black hulls are moist, gently brush the tops of the leaves to help remove loose hulls. 24) Sometimes the black hulls can be rather stubborn and can be removed individually by very gently pulling the hull off with an extremely light squeeze. If you apply too much pressure you will pull the leaves off entirely and lose a perfectly good shoot. Avoid removing the hulls when they are dry as this is when they are stuck more fastly to the leaves. The hulls can also be gently levered off by catching the lower, sharp point of the hull under the tip of the finger and lifting it up and off the leaves. Any few remaining hulls will come off after the harvesting when you wash them in a bowl of water. 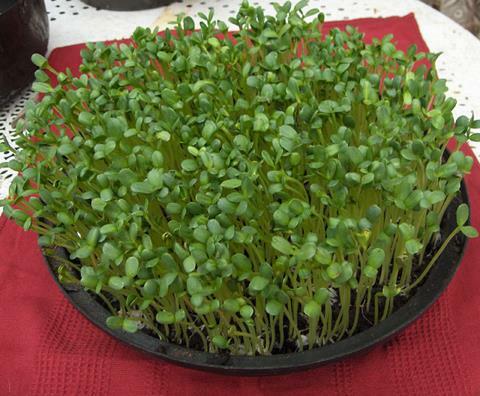 25) After a few more days, being sure to water the greens regularly, you should have a full tray of mature micro-greens ready to eat. 26) Take hold of them in a bunch and crop, with a pair of scissors, close to the base of the stems, but not so close you get lots of dirt. 27) Put the harvested leaves in a bowl and wash, ready to eat. 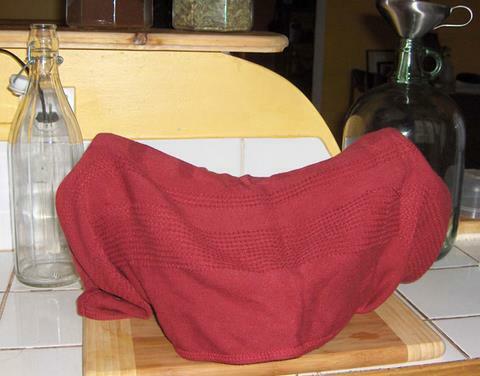 The best way to keep them fresh after harvesting is to wrap them loosely in a kitchen towel and leave in the fridge. The remaining leaves in the tray can continue to grow on your window sill, but be sure to harvest them before the shoots begin to sprout another pair of leaves per shoot, as that is when they become more bitter and lose their tastiness. 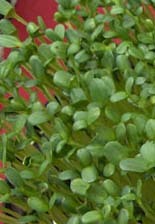 28) Do your favorite salad dressing, mix with other sprouts if you want, or eat them on their own. 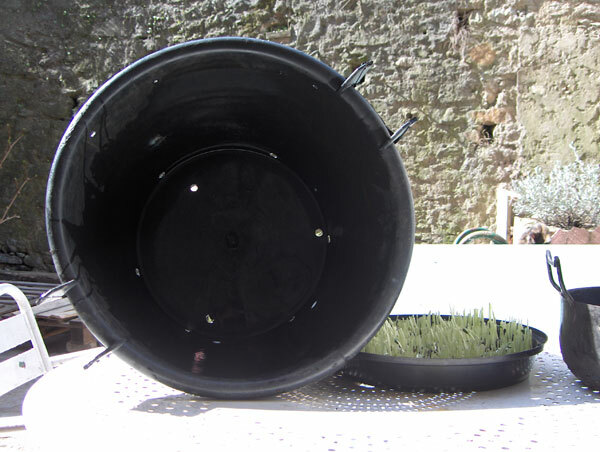 31) …or inside, on a large plant pot tray to catch any drips or stray dirt. 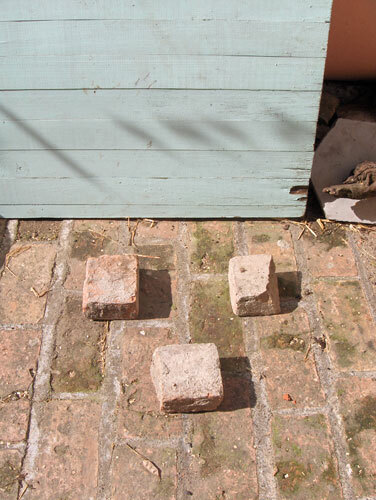 The final set up of two bins, one for putting in your fresh soil mats and vegetable scraps, the other one full and sitting for two or three months to reach maturity, can be put in a kitchen corner, under a table, or in a cupboard. 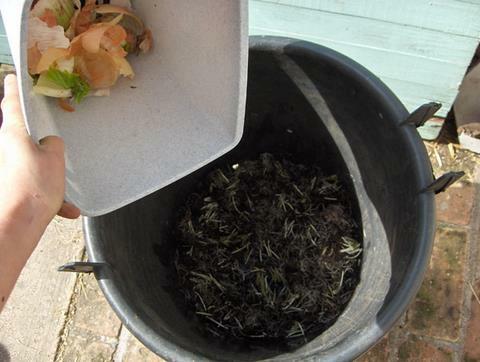 32) Put your remaining soil mat into the bin. 33) Chop it up with a small hand spade. 34) Add your kitchen vegetable scraps. 35) Mix well with a gardening hand fork. This method of reclaiming topsoil is as important a skill to learn as growing the shoots themselves. Knowing how to produce good quality soil is essential. The art of composting is the foundation of self sufficiency. 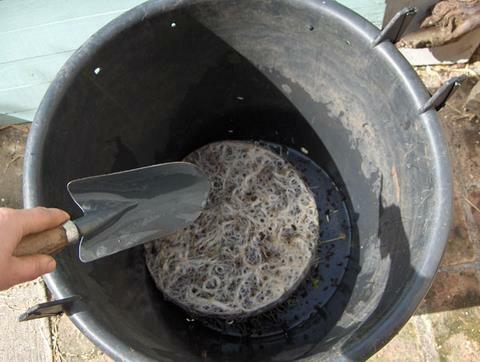 Just buy a handful of compost earthworms from your local gardening shop and this method is complete. Once the first bin is full, begin filling the second, only returning to the first to turn it once a week and it will reach maturity and be ready to use again after two or three months. Coming soon, compost toilets and humanure recycling compost bins: how to make simple, gorgeous compost toilets, save forty litres of water per person per day and create your own top quality compost to sell or to use for growing your veggies. Free yourself from the wasteful, expensive, polluting water grid and do yourself and the planet a favour. Previous Article← Why Is This Building Still Standing? What wonderful tips. Have you tried this with lettuces? Thanks Mary! Not tried it with lettuce, no. Although lettuce has the reputation of being one of the least nutritional of the salads, so I like to stick to the more nutrionally-charged leaves such as sunflowers. Also, what I like about lettuce is precisely the large size of its leaves. What a great post! I can’t wait to try this at home. Thanks! Hi…great ideas for do it yourself salads. 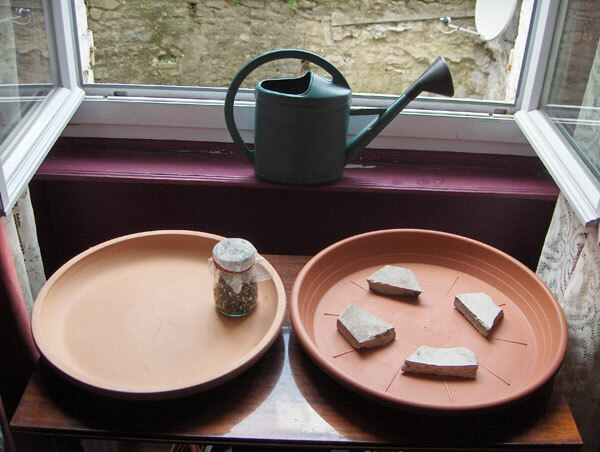 One thing, I’m thinking you may alternatively skip the first steps of putting the seeds in bottles to germinate, instead putting them in a plant pot filled with soil and following step 15 onwards. This is a very thorough post. But almost too involved! I’ve grown sunflower seedlings by soaking overnight, draining them off the following day, and then throwing them in potting mix. They have a high germination rate and as long as they get enough water and sunlight they always seem to thrive. I like growing precisely because they’re not finicky. I grow buckwheat sprouts. 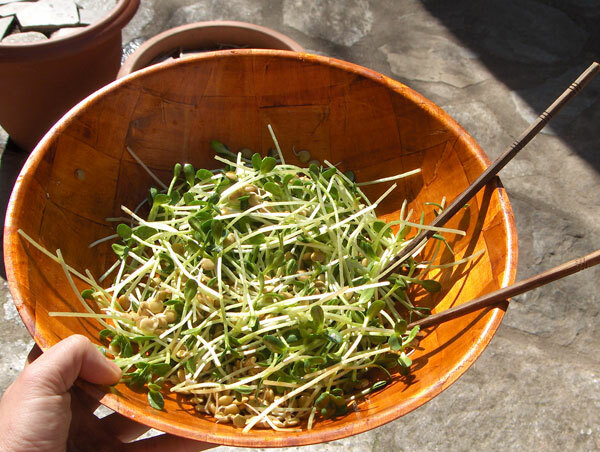 They’re easy to sprout, and simply great, nutritionally.